Raleigh Area Welcomed 16.45 Million Visitors Who Spent $2.5 Billion Locally in 2017. Visitation, Economic Impact and Job Creation at All-Time Highs. Raleigh, N.C. (July 18, 2018) – Figures released today by the Greater Raleigh Convention and Visitors Bureau (Visit Raleigh) show that Wake County welcomed 16.45 million visitors in 2017, an increase of 5.3 percent over 2016. Those visitors who traveled to Wake County spent $2.5 billion locally, an increase of 4.0 percent over 2016. Both figures are all-time records. The organization independently contracted with three nationally respected travel and tourism research organizations, DK Shifflet, Tourism Economics and STR, Inc., to estimate these and other key tourism statistics. According to the research, tourism continues to be one of the largest employment sectors in Wake County supporting 26,170 full time jobs with a payroll of $739.5 million. Tourism employment in Wake County has grown 31.6 percent since 2009, outpacing the county average for growth over that timeframe of 27.3 percent. In fact, the tourism industry in Wake County has added nearly 800 jobs per year since 2009. “The latest data demonstrates that Wake County continues to be a premier tourism destination for meetings, sporting events and leisure visitation in the Southeast and that tourism plays an important role in impacting the economy county-wide,” said Dennis Edwards, president and CEO of the Greater Raleigh Convention and Visitors Bureau (Visit Raleigh). 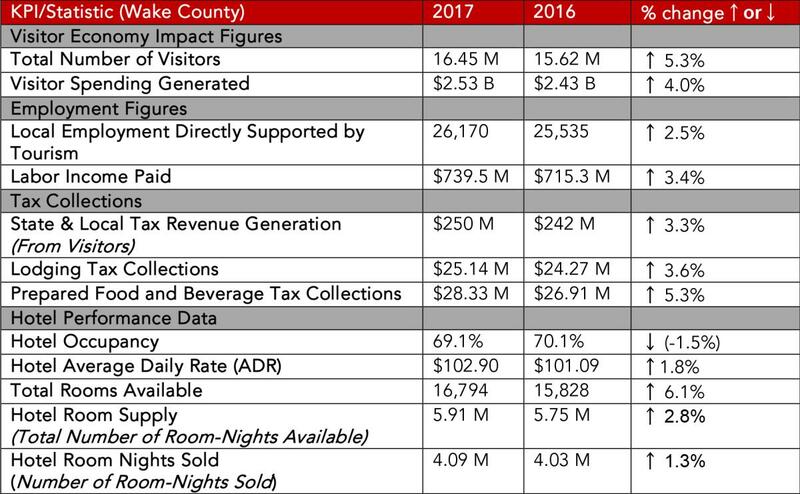 Wake County set several records across key hotel and restaurant performance indicators as well throughout 2017, including a 1.8 percent year-over-year increase in area hotels&apos; average daily rate (to $102.90). Lodging tax collections totaled $25.1 million, up 3.6 percent year-over-year, and prepared food and beverage collections rose 5.3 percent in 2017, amounting to a record $28.3 million. The county hotel occupancy of 69.1 percent outpaced the state average of 63.4 percent and the national average of 65.9 percent in 2017. Wake County experienced a 2.8 percent increase in hotel availability and with that still had an increase of 1.3 percent in rooms sold. The Greater Raleigh Convention and Visitors Bureau (Visit Raleigh), as the official destination marketing organization of Raleigh and Wake County, accelerates sustainable economic growth and development by increasing visitor and convention business. Raleigh/Wake County, N.C., welcomes more than 16 million visitors annually whose spending tops $2.5 billion. The visitor economy supports more than 26,170 local jobs in Wake County and generates more than $250 million in state and local tax revenues, saving each Wake County household $671 in taxes annually. visitRaleigh.com.